Case Study: Life Boats - V. Alexander & Co., Inc.
Life boats used today have evolved from the rowing boats used on the Titanic to high-tech vessels that are designed for exceptional and quick performance under the most severe conditions. Totally enclosed, they are compact and modular, designed to fit into tight spaces and to operate easily. The customer produces larger life boats at his shipyard close to the Weser river in Germany, while smaller units are produced at a shipyard in Poland. V. Alexander’s Project Group task to arrange for the worldwide transport of the life boats to their ultimate destination involves various scenarios that each need a different approach to the shipment at hand. The life boats, which are used in cargo ships as well as cruise ships alike, are delivered not only to shipbuilders mainly in Asia to be integrated in newly built ships, but also to shipyards or dry-docks around the world to replace life boats that are no longer usable. Especially if a ship is in a repair or maintenance facility the time frame to deliver the life boats is extremely tight as the ship owner’s goal is to minimize downtime for this vessel to the absolute minimum. 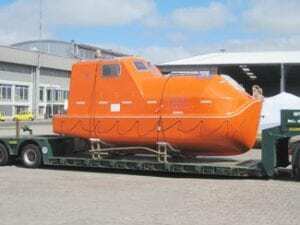 Depending on the size of the unit the life boats are shipped as break bulk, on flat-rack containers or MAFI trailers. Smaller units are sometimes shipped in open-top containers to accommodate loading and unloading needs. In cooperation with its worldwide network of specialized break-bulk partners V. Alexander’s Project Group arranges transportation from the manufacturing shipyard to the shipyard or dry-dock the life boat is needed at, including Customs clearance for export and import. Each project starts with a thorough review of the vessel’s specifications and the transport lane to determine equipment needs and best routing for the required transit time. 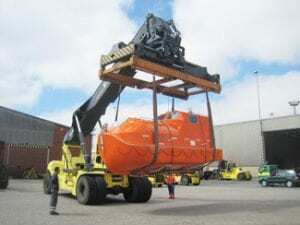 Depending on the size of the vessel the pick-up is arranged and the units are moved to the port of export on drop-deck trailers or in containers. The trans-load operation in the port of export is supervised by V. Alexander locally to assure proper handling of the life boats and loading directly onto a break-bulk vessel (using specially developed wooden cradles that the vessels rest in during the ocean voyage) or onto the respective trailer for Ro-Ro vessel dispatch, and a detailed port receiving report is created. Simultaneously the required import procedures in the port of import are discussed with the local partner. As these vessels are only temporarily imported into the foreign country, all local Customs regulations are reviewed to assure that the customer achieves the best possible classification for his product and with that the lowest possible duty classification. Upon arrival in the port of import, V. Alexander’s partners at destination supervise the unloading of the life boats and the delivery to the final destination based on the receiver’s needs, which might include a trans-load operation in the port to accommodate the receiver’s unloading possibilities. During the process the life boats are again thoroughly inspected and a detailed receiving report is created for the shipper. 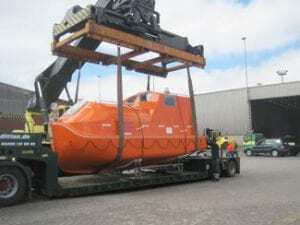 V. Alexander’s Project Group in Bremen has successfully shipped a variety of of these life boats to various different places all over the world to the full satisfaction of the customer. By providing not only transportation and logistics services but also developing unique transport vehicles like the wooden transport cradles V. Alexander provided solutions to the customer that assure the secure transport of a product that, ironically, is best never used.